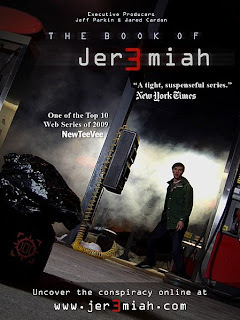 This is not technically a book review, but since the series is called "The BOOK of Jeremiah" I'm going to just call it that anyway. Besides, it's extremely unlikely that I will ever review a DVD again, so why go to the trouble to create a new category? Just before we left on the Epic Vacation, my blogging friend Jana emailed me to see if I would be willing to review a DVD of a web series. I was completely intrigued by her description of the show, and told her that I would definitely do it. And then I went on the longest vacation in the world and forgot all about it. So I was pleasantly surprised when, a couple weeks ago, a package containing two copies (one for me and one for you) of The Book of Jeremiah arrived on my doorstep. It took a few days before the Maestro and I were able to sit down and start watching it, but when we did we were totally hooked. This web series was a project created by a film class at Brigham Young University under the direction of Jana's husband, Jeff. It was made with the low budget you'd expect from such a project, and yet it certainly doesn't seem like it. It is very well done, with good acting, good cinematography, and, most importantly, a compelling plot. Now, I like the LDS films that are out there. I remember going to see The Singles Ward in the movie theatre while 8 months pregnant and laughing so hard I had to leave the movie. Twice. I can laugh at our religious culture the way these movies do. But after about 421 more movies just like The Singles Ward (including Singles Ward 2) I got really tired of that genre of movies, and while there were a few serious ones out there, I would have liked to see something that really took who we are and what we believe and made it into something significant, but not absurd or overly melodramatic. The Book of Jeremiah most definitely achieved that, which is why Joel and I enjoyed it so much. It's a series of 20 episodes, each lasting anywhere from 2-15 minutes. We did not want to stop watching and stayed up until nearly 2 am one night trying to get through it, but still had to finish up the next night because we couldn't keep our eyes open any longer. The show addresses some important LDS themes like the battle between good and evil, prayer, repentance, scriptures, forgiveness, truth-seeking, personal revelation, obedience, and trust, but does it in a way that doesn't seem overly corny or preachy. "Jeremiah must resolve his aching need for an orienting identity. Ironically, that is what Mormonism is all about. Latter-day Saints claim an eternal identity; however, the media productions of Mormonism are seldom about feeling all the more lost and endangered for having a spiritual and eternal identity. This series sits on the edge of Mormonism, taking its ideas of eternal progression and individual mission so seriously that the stakes are realized in human terms, with evil as present and potent a reality as God." I do have one copy to give away to one of you lucky readers, but I really want the rest of you to see it, too. The series is now available on DVD at Deseret Book and Amazon, and I think every one of you should buy it. If you're not as sure of that as I am, go watch the trailer first. If you'd like a chance to win the DVD, just leave a comment on this post. I hope you win! This sounds like something my family really needs to see! Thanks Lara! If you don't give it to me I will for sure be looking for it. lol. Nice write up! Just pack it up and send it back to Utah HeHe. I am so curious about this so, yes, I'd love to win! This sounds great! I'd love to win it! I've been wanting to watch that forever! Really! I want to win---especially having met Jana the other night. It'd be fun to watch with that connection. I just put up my Jer3miah post too. :) It is so unique and well-done! Great post! I'm glad you liked the show. We had fun making it and are happy people continue to enjoy it. Thanks for getting the word out! Loved it when it was online (is it still?) would love to own a copy. Thanks for letting me know where to get one! I would graciously accept such a wonderful gift. Jared and Gideon are wonderful peeples. Count me in. I'd love to view it. I agree, I watched it all as it came out on the web, really enjoyed it. I have also heard great things about the series, I'd love to win it on DVD! After reading your review and watching the trailer I'm intrigued. Love to support LDS projects! I really need another tv show/book/hobby to get hooked on, so sure, sign me up! That definitely looks interesting! When is your giveaway over? Thanks for everything!